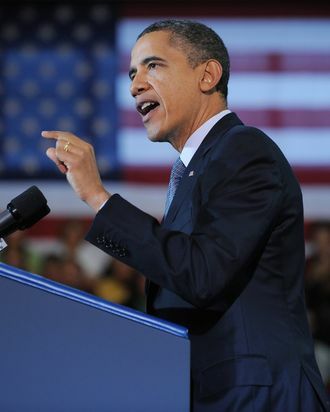 US President Barack Obama speaks during a campaign event at the University of Vermont in Burlington, Vermont, on March 30, 2012. Obama is on a day trip to Vermont and Maine to attend campaign events. Yesterday, the Senate immigration bill received its Congressional Budget Office budget score, which is kind of like a bar mitzvah for major legislation. They did great! In budget terms, the bill would reduce the deficit by nearly a trillion dollars over its first two decades, by bringing in and legalizing younger workers, who pay more in taxes than they receive in benefits. But what the report really offers, beyond a guess at the impact on the government ledger, is a window into President Obama’s vision of long-term economic growth. For various reasons, Obama’s strategy to foster long-term prosperity has failed to attract attention. Liberals have generally, and understandably, concentrated on his response to the short-term economic crisis. Many of Obama’s growth initiatives are also wrapped together in social goals, which have instigated political controversy and obscured their growth-generating goals. CBO’s report notes that it does not attempt to measure the effect of these changes – it omits “any budgetary effects attributable to changes in the productivity of labor and capital, the income earned by capital, the rate of return on capital (and therefore on the interest rate on government debt), or the differences in wages for workers with different skills.” Just because CBO can’t measure it, though, doesn’t mean it doesn’t happen. It’s a a primary rationale for the policy, just one that hasn’t occupied the center of the debate. Health-care reform is another example. The humanitarian goal of providing universal access to medical care dominated the debate. But Obama used the bill just as much for economic purposes. It will free workers from clinging to jobs they need solely for the employer-sponsored health insurance, making the labor market more flexible and entrepreneurial. And the administration invested enormous political capital in reforms designed to bring down the cost of medical care, which has been eating up progressively larger chunks of the economy. Some of the most important reforms in Obamacare were an ambitious list of technocratic proposals with a history of bipartisan support, but which were ignored or polarized when Obamacare turned into a culture war. Higher taxes for the rich: Succeeded, with the combined goals of rebuilding the revenue base in a way that minimizes skyrocketing economic inequality. Financial regulation: Mostly/partially succeeded, with the outcome pending fierce regulatory battles. This fight has been defined mostly as a morality tale about punishing Wall Street for its role in creating the financial crisis (versus the conservative narrative that the crisis occurred because liberals made banks loan money to the poor and irresponsible.) But it’s also an attempt to stabilize the boom-and-bust financial cycle. Primary education reform: Successful. You haven’t heard much about this, have you? Obama snuck a sweeping spur to education reform, Race to the Top, into the stimulus, which was passed quickly amid a global economic meltdown and thus largely ignored. The fact that its most bitter foes are liberal, and conservatives kind of like it, has given partisans on both sides an additional incentive to ignore the issue altogether. But it’s a broad-based attempt to harness educational outcomes to data-based metrics. Early childhood education funding: Unsuccessful. In his last State of the Union address, Obama proposed a comprehensive national investment in high quality early childhood education. It probably won’t pass anytime soon, but it fits comfortably within his blend of social goals (opportunity for poor children) and human capital strategy. A national infrastructure bank: Unsuccessful. Administration officials bring up this idea all the time, baffled that a notion with broad intellectual support and economic appeal to business has no chance of passage in the militantly anti-spending House. When conservatives consider this list, they see a litany of big government that could be motivated only by class warfare. Economic growth is a slogan conservatives have managed to own for themselves, and they have defined it as almost synonymous with low taxes and regulation. The idea that some other strategy could induce growth while also advancing liberal social goals strikes them as literally incredible. That mentality can be seen in the conservative response to the CBO’s immigration bill score. Jeff Sessions, last seen peddling fantastical claims about Obamacare and the budget, gawked, “The bill’s drafters relied on the same scoring gimmicks used by the Obamacare drafters to conceal its true cost.” The CBO also found that Obamacare reduces the deficit by a trillion dollars in its second decade, a prediction that, at the moment, looks if anything like a large underestimate. Noam Scheiber’s history of Obama’s response to the economic crisis, The Escape Artists, captures an irony of the Obama presidency. Fashioning a long-term growth strategy is, and has always been, Obama’s deepest passion. He’s been caught up in an economic crisis and a culture war over the role of government that he wants badly to escape.